The formation flying continues on day two of the Volvo Ocean Race's seventh leg eastbound across the North Atlantic between Newport, RI and Lisbon. Since setting off on Sunday and leaving the Nantucket Shoals exclusion zone to port yesterday morning, the boats have been digging south of the great circle en route the southern side of the ice gate, located to the south of the Grand Banks. The leg so far has not been without its controversy. Below Matt Knighton, OBR on Abu Dhabi Ocean Racing, reports that Dongfeng Race Team, MAPFRE and Team SCA all broke the rules by cutting the corner at one of the Exclusion zones, the boats had to pass before emerging into the Atlantic proper. 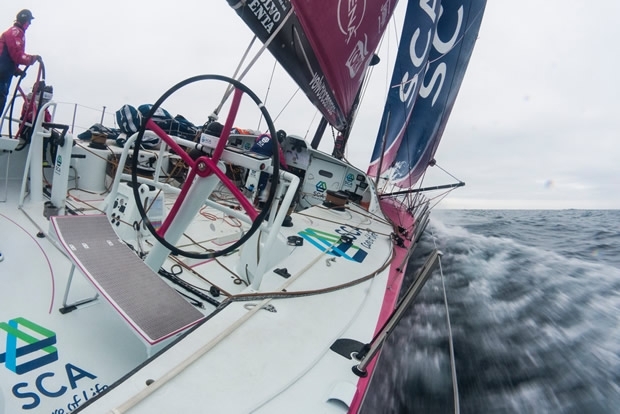 Since then the boats have been enjoying good conditions, edging up onto an easterly heading yesterday evening (UTC) with Dongfeng Race Team taking up residence to the south and with Team Brunel, MAPFRE and Team SCA in the north. At the first sched in the early hours of this morning Abu Dhabi Ocean Racing had managed to nose into the lead in the middle of the race track, but less than a mile separates her from Dongfeng and third placed MAPFRE. At present the crews are enjoying moderate winds of around 13-15 knots with the wind more backed into the north, compared to the GFS and European models, which suggest the wind should be more northeasterly. Over the last days the navigators will have been looking intently at the Gulf Stream and today the boats should be encountering the fast-moving ocean-going conveyor that can play snakes and ladders with sailing boats depending upon if they are in a favourable or an adverse eddy. The northerly breeze versus the generally northeasterly flowing Gulf Stream is likely to kick up a nasty sea in places. Key at present is to get east as quickly as possible because the area of high pressure currently over the Nova Scotia coast is forecast to turn into a NNE-SSW orientated ridge, more or less where the boats are currently by this afternoon. However longer term it appears that this light patch will inevitably catch the boats as they approach the southern extremity of the ice gate. Matt Knighton reports from Abu Dhabi Ocean Racing. Just minutes earlier, we had gybed several times around an invisible mark in the ocean. The spectators on the last few power boats shadowing us would never have guessed it was there – there was no blinking buoy or square floating mark – it’s marked by GPS coordinates. This specific mark was the corner of a larger box that forms a Traffic Safety Separation Exclusion Zone. Consisting of two lanes for incoming and outgoing ships with a figurative barrier between, oceangoing vessels use these TSS areas for safety in high traffic areas. Before the leg, race management decided that teams needed to either respect the correct flow of traffic in the lanes or not enter the zone at all. Dongfeng, Mapfre, and SCA entered the zone. We watched as their courses on the nav computer sailed deeper and deeper into the red colored box against the traffic flow. Their routes didn’t just cut the corner on a piece of open water with little significance – no, they were the equivalent of riding a bike across an eight-lane highway and then turning left into oncoming traffic. They had raced several miles down the course while we had to perform several tacks to get around the zone. Ian, SiFi, and the rest of the guys – still buzzing on deck from the magnificent send-off in Newport – were furious at the loss. The day has now turned to a familiar darkness and below deck you can hear the light drips of water on deck from the dense fog bank we’re sailing through. The deck is faintly glowing through a dull haze lit by the red instrument lights. Chuny somehow managed to smuggle a half dozen bags of potato chips onboard before we left and just broke a bag open. Sharing it with all the guys gathered around the nav station, there’s a faint crunching sound as every eye is fixed on the gap that’s growing between Dongfeng and ourselves. Will there be a penalty? We don’t know. All we can do now is chase them down as Lisbon grows nearer on the horizon.